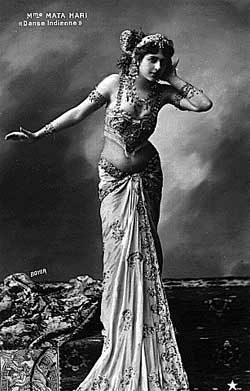 Born Margarethe Zelle in the Netherlands, Mata Hari established herself as an exotic Javanese dancer, traveling and performing throughout Europe before World War I. With the onset of the war, she continued to travel and became associated with the secret service on both sides of the conflict. Evidence about the exact nature of Mata Hari’s espionage activities remains inconclusive, but because of French suspicion about her possible involvement with the Germans, she was arrested, imprisoned, tried in court, and executed by a firing squad.